The power’s back on. Two days after a destructive storm whipped the DC area, the lights are back on at our house. We’re among the lucky ones. Two days after the storm, there are still more than 100,000 households still in the dark. I’m reminded of this as I sit among the powerless masses at the big-name bookstore with the free WiFi. Though I sit here because I’ve got a few hours to kill while our car is being tuned up and checked out before our big drive to OBX, others are scrambling for the coveted seats by an outlet because this is one of their only opportunities to juice up. So, sure, when the auto shop calls, I’ll get to go back to a glamorous life of laundry, but this storm has gifted me new reminders of what I have to be grateful for. “Extended family”: As in, friends who extend a helping hand, without even being asked. Our wonderful friends Galit and Michael, who have a son The Diamond’s age, offered us a place to stay before we even knew we wanted one. We were actually getting the kids (and ourselves) prepared for a dark, hot night at home Sunday when Galit called. As soon as she found out it was lights-out around at our house, she invited us to hers. We hesitated for a few minutes as we debated the pain of packing vs. the pain of trying to get ready for work/camp in the morning without electricity. The pain of packing seemed less, so we threw some things in some bags and headed to their house, about 10 minutes away. We made an excellent choice. Turned out the power was out at The Diamond’s camp, too, so he and his friend got to spend Monday together, playing beautifully all day, from rise-and-shine straight through to bedtime. The house’s wireless connection was a bonus for me. Michael and Galit made us feel truly welcome and at home. It’s only food: That’s all we lost when we lost power. Completely replaceable. Several people, including a 6-year-old boy, tragically lost their lives in this violent storm. Completely irreplaceable. Sigh. 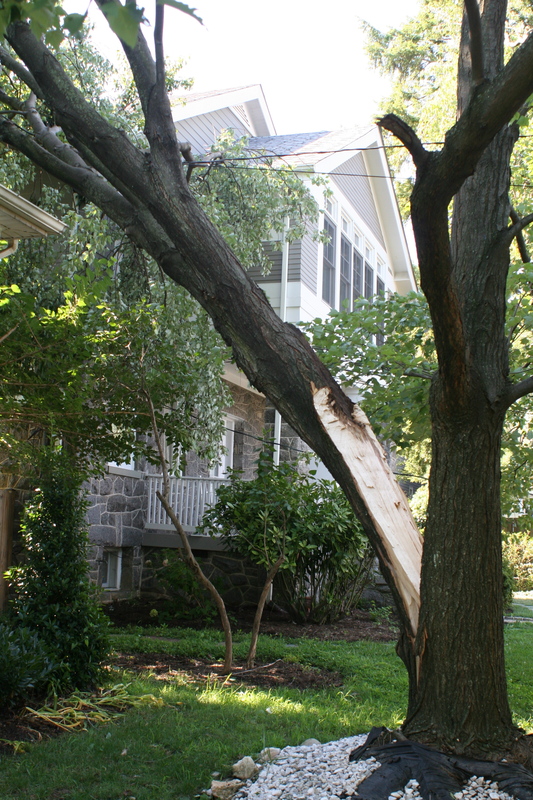 No damage: Around the corner from us, a huge tree toppled, taking the sidewalk with it and narrowly missing a house. You can see it in the main photo with this post. We assume that’s what caused our loss of power. Directly across the street from our house, the tree trunk in the family’s front yard split, with half now resting on their roof. It will likely rest there another couple of weeks because the family left Saturday for a wedding celebration in Italy. And about a half-mile from here, one friend of mine could look down from her third-floor condo’s window INTO the top floor of a house across the street, as if she were peering down into a dollhouse. A tree had gone right through the roof. Fortunately, the owners were not home at the time, though a search-and-rescue team did find the dog. Alive. These stories of destruction and others make me realize how stupid it was for me to sit here watching this incredible storm through our new bank of 9-foot-tall windows. Isn’t it funny, that whole it-can’t-happen-to-me mentality? Our house may have lost electricity, but what I found was much more precious. New reasons to be grateful. And gratitude can generate enough power to light up a lifetime. What have you been grateful for when there’s been a storm in your life?